at maturity level 1, is key! What is the EA Dossier Standard? When an organization wants to work with enterprise architecture effectively or when separate architecture documents and visualizations are created by employees and suppliers, it is a best practice to start maintaining an Enterprise Architecture Dossier. The Dragon1 open EA method defines a set of reference architecture documents and models that have shown their value the past 20 years in organizations for working with Enterprise Architecture effectively. These documents and models have been made part of the EA dossier standards. NOTE: Setting up and publishing a Dragon1 compliant EA dossier takes no more than 1 day! You can upload or import this ArchiMate XML file in the Visual Designer and tailor it to your own Enterprise Architecture dossier. Next, you can use the Architecture Checker to see how compliant your EA dossier is to the standard and what your to do list is. Dragon1 Maturity Level 2: Business Processes & Capabilities Focused - In all business processes the stakeholders are aware of and have access to approved architecture products and provide feedback. It is common to make use of the architecture products in design and planning of business processes and capabilities. 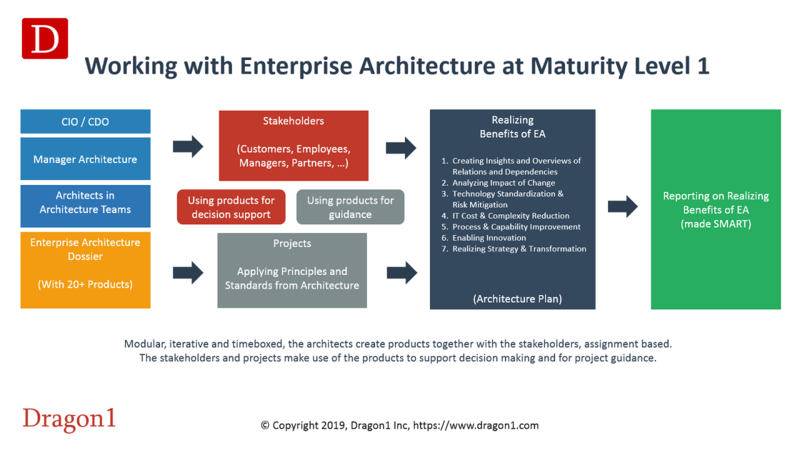 Dragon1 Maturity Level 3: Product Line & Governance Focused - In all products lines the stakeholders are aware of and have access to approved architecture products and provide feedback. It is common to make use of the architecture products in developing new business products and governing organizations. When a company wants to do, for example, digital transformation, it needs an outside-in-thinking by a CDO, but it also needs an inside-out-thinking by the CIO. That is where Enterprise Architecture supports digital transformation and why every company really needs an enterprise architecture dossier at maturity level 1. 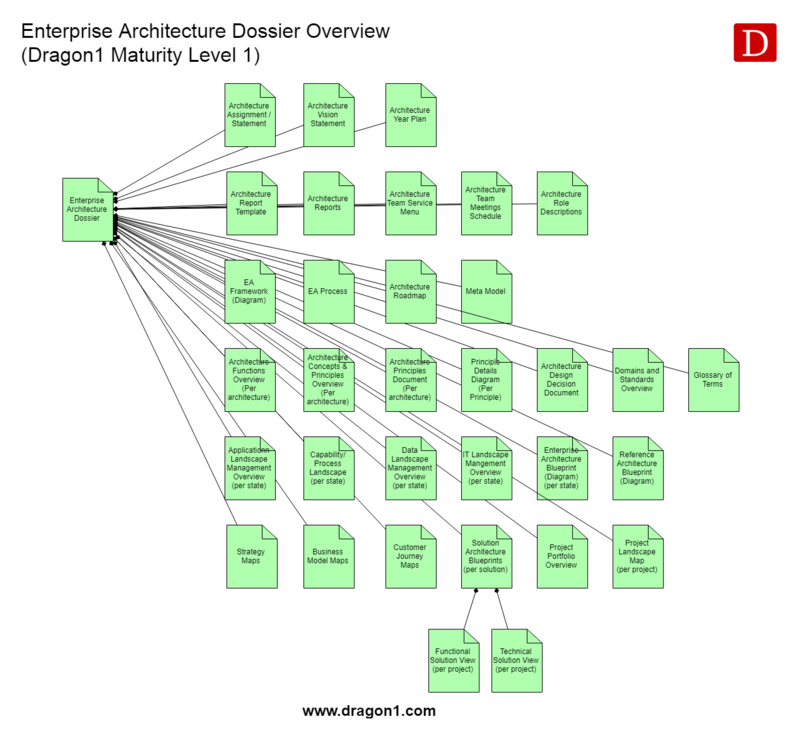 Dragon1 as method promotes the usage of an Enterprise Architecture Dossier (EAD). An EAD is a set of documents, products and visualizations that provides everyone in the organization insight and overviews in the current and future architecture. An EAD can have many forms. It can be a folder on a server with documents (Word and PowerPoint), a set of intranet pages linking to files, a physical file or binder with printed documents or data stored in a repository or architecture tool. An EAD stimulates making reuse of architecture documents. When it is placed in a central access point, all stakeholders can quickly use it in their work. Enterprise Architecture and its sub-architectures are not static, therefore is it also a best practice to structure the EAD for change. If there are changes request for architecture and documents, it can and must be able to process it quickly. This obviously means that a printed version of an EAD is less handy, or having documents only in PowerPoint or Word documents. The best option is to have an EA Tool where documents and visualizations can be maintained and generated with a set of data objects and models. Dragon1 as a method provides for a maturity level focused practice for setting up and maintaining and EAD. At this maturity level, the organization often makes use of architecture in projects, architecture teams create overviews, but there is no architecture working processes or architecture plans yet. At maturity level 1 we focus on the first management overview per product or model. A product or model can and will have more views over time, but it is important to have a first view that satisfies most stakeholders in their needs. Users list - A document that names which stakeholders, persons and roles have what kind of access (rights) to the dossier. Architecture Assignment / Architecture Statement - This is a document where a director states the mission, vision, ambition and goals for working with enterprise architecture in the organization and declares him or herself the owner of the architecture. Often the architecture manager and architects that are responsible and accountable for EA are named. In the document it is described when working with EA in the organization can be seen as a success and how that can be measured. On a yearly basis, this document should be updated. Architecture has a direct effect on everything when you make sure the current and future standards and principles that should be used are approved by decision makers and known and available for projects. If no use is made of an Enterprise Architecture Tool (modeling tool) or repository, but of drawing tools only, this has the drawback that no dynamic interactive views can be created or generated for stakeholders. If you are a manager of an architecture team or an architect, the matrix below might help you to organize the work and manage priorities and expectations outside and inside the team. 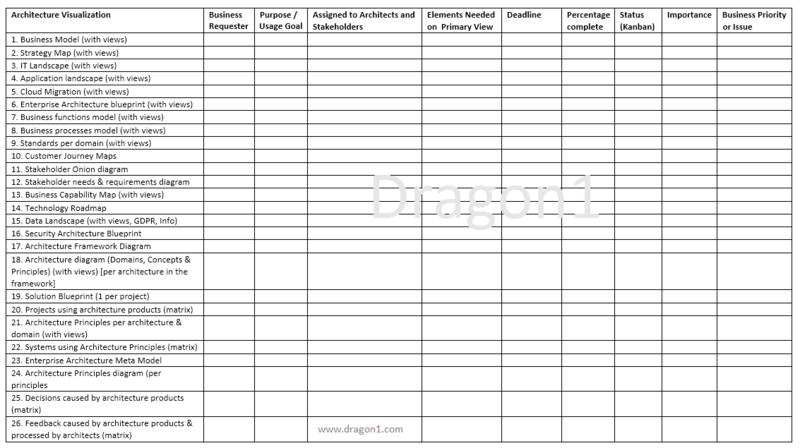 This matrix is called the Dragon1 Architecture Visualization Matrix and show the most common and important visualizations that stakeholders request and need for decision making and project guidance. We have seperated this matrix from the non visualization products, like processes and plans. Dragon1 advises to place these products in a second matrix for optimal management. If there is use made of an Enterprise Architecture Tool (modeling tool) and repository, instead of only drawing tools, this has the benefits that easily dynamic interactive views can be created for any type of stakeholder. Thus providing them instantly with decision supporting visualization they need. An Enterprise Architecture Dossier is focused on an era of three to five years and consists of a permanent enterprise & reference part, and a dynamic projects & solutions part. The EAD contains an Architecture Baseline (the permanent part). It holds the first set of products that always should be created, no matter what.